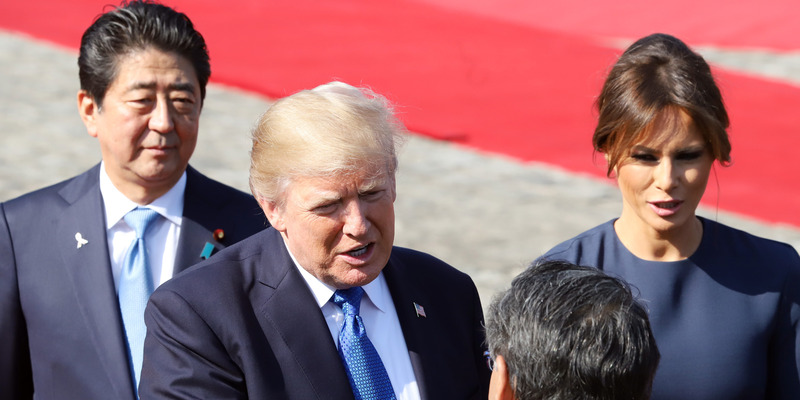 YOSHIKAZU TSUNO/AFP/Getty ImagesShinzo Abe and Donald Trump. Japan is slipping further into the background on North Korea, despite its history of being Washington’s closest ally on the issue. After Kim Jong Un’s surprise visit to China this week, Beijing contacted both Washington and Seoul while Tokyo was left out. Since the US and South Korea also have plans to meet Kim, Japan is the only regional power which is not playing an active part in discussions. It’s a blow for Prime Minister Shinzo Abe, who was an early and enthusiastic Trump ally. Japan’s diplomatic stature in its own backyard is in decline as the nation was left completely out of the loop after Kim Jong Un’s visit to China this week. While the whole world was kept in the dark about Kim’s meeting with Xi Jinping until after it was over, China made sure to let the US and South Korea know about it later – a courtesy not afforded to Japan. The White House confirmed it received a call from Beijing on Tuesday morning (local time) about the visit, and South Korea’s presidential office said on Wednesday it too was briefed by the Chinese government, though they didn’t say when. One of China’s top diplomats is also set to brief officials in Seoul on Thursday. But Japan, which has had to face a number of missiles launched over its country by North Korea, has not received a call from Beijing. On Wednesday, Abe told a parliamentary committee that Japan is still hoping to hear from China about the meeting, according to The Washington Post. The country’s largest broadcaster NHK reported Tokyo has had to ask China for details on the Kim-Xi meeting and that its foreign ministry is “arranging a meeting” with Chinese counterparts. It’s a slip further into oblivion for Tokyo, which was long Washington’s closest ally when it comes to North Korea. Since Trump took office, Abe made a great effort to form a close personal relationship with the businessman – mostly in the form of golf diplomacy – and the two bonded over a hardline approach to North Korea. Aside from several international visits, in the first 11 months of Trump’s presidency the two spoke on the phone 13 times –more than Abe did during Obama’s entire second term. But Abe, and Japan, have suddenly found themselves on the fringes. The ally received no warning about Trump’s decision to accept a meeting with Kim, and has been scrambling ever since and even tried to set up its own talks with Kim. Unsurprisingly, when Trump advised Abe of his decision to meet with Kim the Japanese leader requested a meeting at the White House ahead of any US-North Korea bilateral talk. A summit is expected between the two on April 18.